Goldfish are susceptible to a wide range of bacterial pathogens, including aeromonas, a type of bacteria that causes hemorrhagic septicemia in these cold water fish. When they enter your pet's blood stream, the result is often septic shock, which is invariably followed by death.The first signs of hemorrhagic septicemia are red streaks that are soon followed by skin lesions. These legions, superficial at first, deepen to ulcerations and the destruction of underlying muscles. Stress and overcrowding are common causes of hemorrhagic septicaemia. Because the disease is transmitted by infected fish as well as contaminated water, large populations can quickly perish in the confines of a small, poorly managed aquarium or pond. An ammonia spike in the water can also be the culprit behind an outbreak of this disease, as too much ammonia stresses the immune system in fish, rendering them too weak to fight off these destructive micro-organisms. 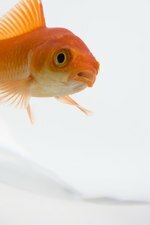 If your goldfish suffers from hemorrhagic septicaemia, you will likely notice external reddening and hemorrhaging, as well as ulcers over different areas of the creature's body. These lesions quickly develop into open wounds which destroy the fish's skin and underlying tissues, including the muscles. Exophthalmus, or the protrusion of one or both eyeballs, can also occur. Fluid normally builds up in an infected fish's abdomen, and purple or red spots will be visible on his body. The fish's mouth and fins will hemorrhage as the skin becomes discolored, and as the disease progresses, it eventually destroys the goldfish's heart, kidneys and liver. Diagnosis of hemorrhagic septicaemia is confirmed by culturing the disease organism from infected goldfish. If too much ammonia in the water is the cause behind an outbreak, your fish will likely exhibit signs of hyperventilation, or excessively rapid breathing. This is because higher levels of ammonia in the water of your aquarium or pond will ultimately result in lower levels of oxygen, you may notice your fish gasping at the water's surface or swimming about erratically. Goldfish are heavy bodied fish that produce large amounts of metabolic waste, including ammonia, so their environment needs a filtration system that is mechanically, chemically and biologically strong enough. 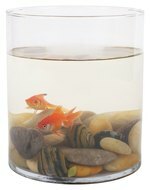 Provide your fish with a well oxygenated habitat, and rinse or replace dirty filter material on a regular basis. Broad-spectrum antibiotics are most successful in treating hemorrhagic septicaemia, but diseased fish should be housed in a hospital tank for treatment so that the antibiotics do not destroy the beneficial bacteria in the filters of their pond or aquarium home.